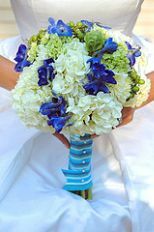 Blue wedding flowers are a great choice regardless of the season you have chosen for your wedding. Whether it is a summer garden theme or a blue ice winter theme, they will definitely have a big impact on your day. There is a fine line between blue and purple flowers, and may be hard to tell the difference sometimes. Make it clear to your florist that you want blue, and if possible give them an example of the shade of blue that you want to work from. 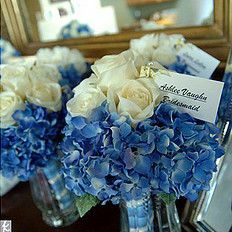 Blue flowers can be part of a blue wedding theme, or used to brighten up any theme or style that you choose for your wedding. Listed below are the top 5 picks. Perfect for late summer and fall weddings hydrangea are a beautiful addition to your flower wedding centerpieces. They work well with roses and other white flowers. Durable and heat resistant, petunias are perfect for warm climates and mid-summer weddings. There are many varieties of blue that also come in combination with white and yellow. Lilac can grow to 10 to 12 inches which make them a great choice for your centerpieces and reception decorations. Their strong scent will create an inviting atmosphere at your reception. Statice is the perfect filler or accent flower. Blue varieties can also include white buds which can help to pair them up with white roses or any other type of white flower. Found in several beautiful shades of light blue, forget-me-not are great accent flowers. Matching up your bridesmaid dresses and theme color to them creates a breathtaking effect.